Customized Summer and Winter Vacations - Alaska Wide! One Stop Shop for all locations in Alaska! We'll be with you on your entire Alaskan Journey! THE ALPINE SUMMER PACKAGE! (May 15th to September 30th) We specialize in creating a custom Alaskan Vacation for you. See something or hear about something in Alaska that you must see? Get ahold of us and we'll get you there! Want a list of suggestions? Let us know! Prices and length of stay vary depending on what you would like to do during your Alaska Dream Vacation. Denali Highway - Voted in top five mosts scenic drives/locations in the world by National Geographic. Brooks Range/Arctic Ocean Trip! Incredible vistas and wildlife, from Musk Ox to Arctic Fox, Wolves and more! Seldovia boardwalk walk and Homer Boat Harbor! Denali National Park. Bears, wolves and of course, "The Mountain". Salmon and halibut ocean fishing out of Seward or Valdez. River fish the Famous Kenai River. 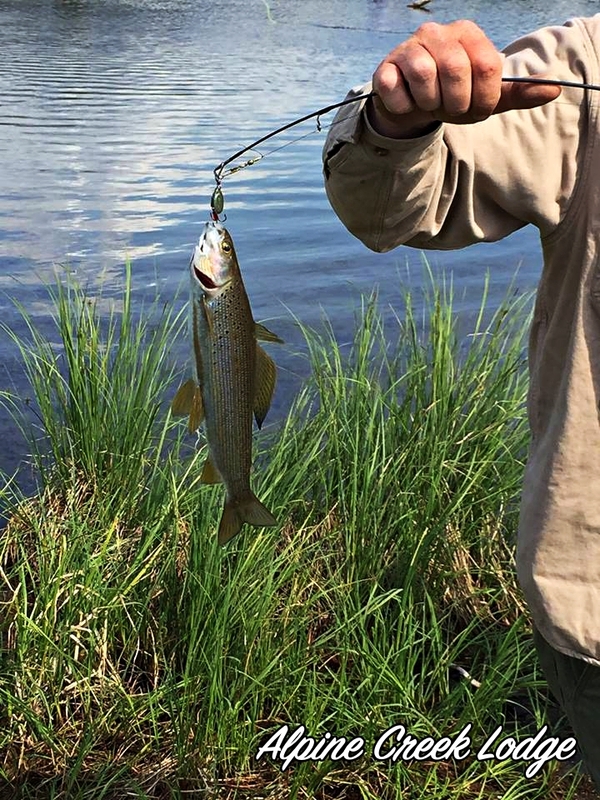 Trophy Arctic Grayling on remote streams on the Denali Highway. Gold prospecting and panning. Search for the "Mother Lode"
Backcountry Jeep/Hummer/ATV tour, Denali Highway. This is just a sampling list. We will be with you on your journey with our lifetime experience of traveling and enjoying Alaska. Pricing will vary depending on your pick of excursions. Minimum of 3 days and a day for pick up and a day for drip off. Always ask about group discounts for 2 or more people! We'll work with you! Group size up to 15. Possibly more with advance notice. All packages are inclusive. 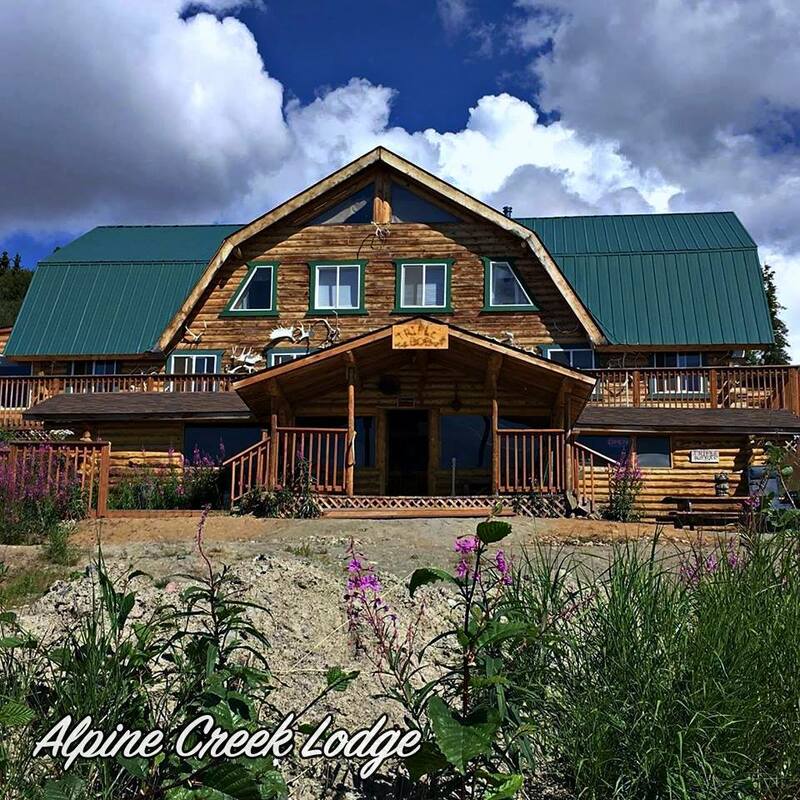 All you have to do is step off the plane in Anchorage or Fairbanks, and everything else will be taken care of by the Alpine Creek Lodge Family and Staff. THE ALPINE WINTER PACKAGE! (October 1st to May 14th) Prices and length of stay vary depending on what you would like to do during your dream Alaskan vacation. Dog Sled the wilderness of the Denali Highway. Ice fish for trophy Lake Trout and Burbot near Alpine Creek Lodge. 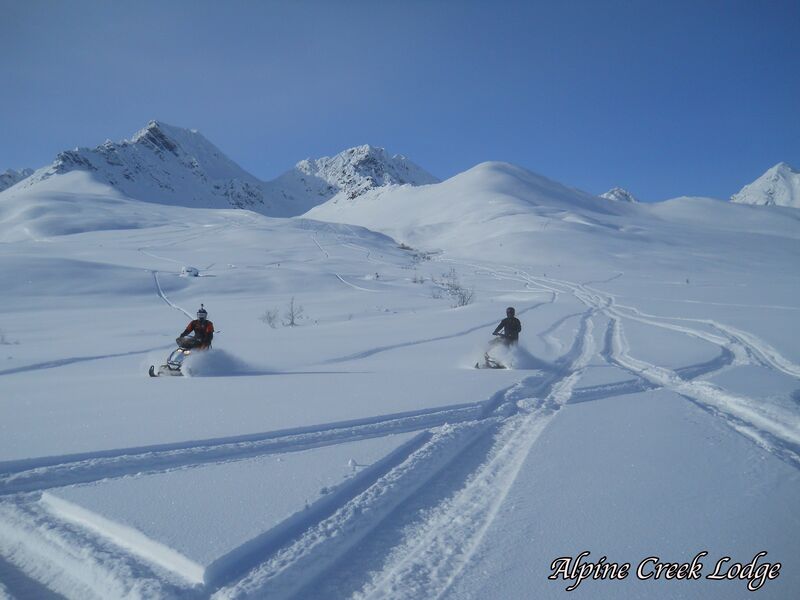 Travel to the Brooks Range and Artic Ocean in Winter! Musk Ox, caribou, wolves, lynx and more! An amazing trip in Winter! Spend the night in Fairbanks, Coldfoot and Deadhorse. Chena Hot Springs and Ice house, plus Santa's house in North Pole. A must experience for any vistor or Alaskan! 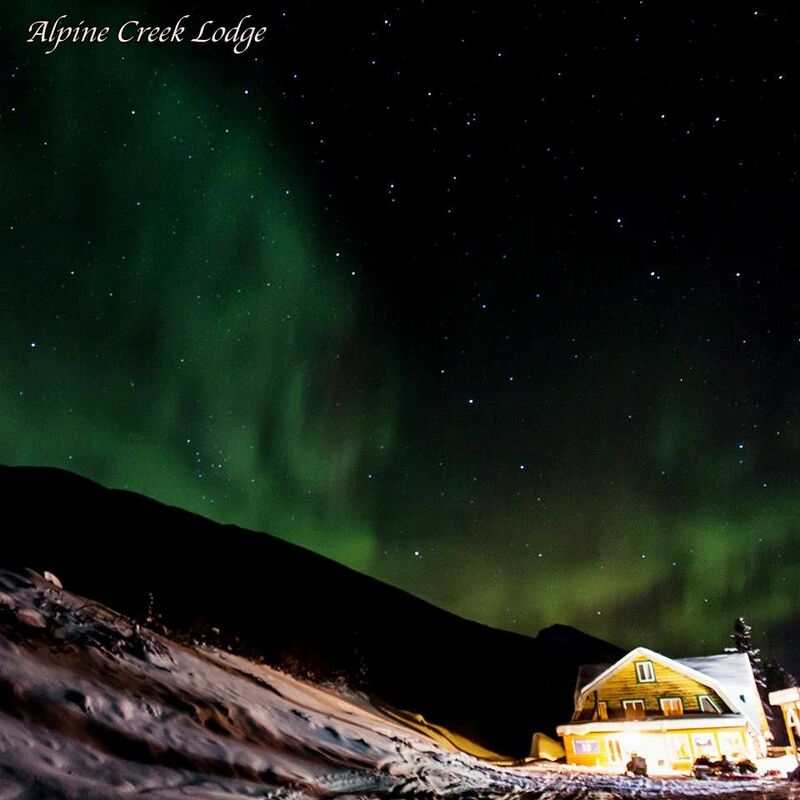 Aurora Borealis viewing on the Denali Highway, at Alpine Creek Lodge. Snow mobiling/machining on the trails of pioneers on the Denali Highway and trails! Walk in a Glacier Ice Cave on the Denali Highway! Winter cruise out of Seward! Glaciers, whales and more! Iditarod Ceremonial Start and actual Start in Anchorage and Willow! This is a sampling list. We will be with you on your journey with out lifetime experience of traveling and enjoying Alaska. Note that weather conditions, spring and fall, may have to be adjusted each year. Mid April through late May can bring some interesting weather and conditions. Late September to late October may have issues as well. We can always get you in, but we'll have to decide whether your riding snow machines or Jeeps!